Ever since the first model of the Corvette was introduced in 1953, the interest in the new car became so large that GM had scrambled to make the first 300 to sell later that year. In 1954, General Motors was prepared with nearly 4000 hand-built and ready for sale. There has been 64 years of history behind the Corvette, and from the first C1 to the latest C7, these cars have been iconic of American automotive design. If you are the owner of any style Corvette, you have a beautiful car to be envied, but if your model is one of the older ones, or your Corvette has certainly seen better days, what should you do to restore it? Even though you want to work on your baby all by yourself, sometimes it is better to find someone you can trust her to. You know for sure you can’t just give your Corvette to anyone; you need to find a shop who will give the exact same care you would give her. Express Collision Center fits the bill. Express Collision Center is your go-to Corvette restoration experts. Our over 70 years of Corvette experience you to trust your Corvette to us, and you can be sure we will only do it the right way. 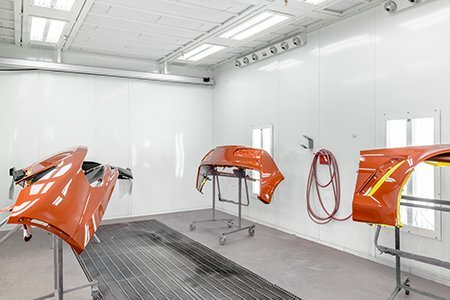 So who would you rather trust with your Corvette restoration: a big box dealership bodyshop in the pockets of the insurance companies, or an honest family run auto body shop where everyone is absolutely in love with the Corvette and gives them the attention you would give to your own Corvette? I have my answer, and so do you. You would pick Express Collision Center every time. If you have a beautiful, stunning Corvette, but it has been through a lot over the years, you owe it to yourself and your vehicle to have it fixed up by the best in the business of Corvette restoration you can find here in Las Vegas. Call Express Collision Center at (702) 676-2010 or come see our shop at 5450 Desert Point Dr., Las Vegas, NV 89118 today!